These sweet potato enchiladas, that are filled with healthful ingredients including spinach, black beans, sweet potatoes, and peppers, are smothered in a homemade enchilada sauce. But healthy isn’t the only reason to indulge in them. They’re Tex-Mex deliciousness. And they just happen to be vegan. 1. Finely chop the roasted peppers and set them in a strainer or colander in the sink to drain. 2. In a medium bowl, combine the mayonnaise, garlic, jalapeño, salsa, raisins, cinnamon, and allspice. Stir in the drained peppers. You can cover and refrigerate the enchilada sauce for up to 1 week. 3. Preheat the oven to 350°F (175°C). Lightly oil a 9-by-13-inch (22-by-33-cm) baking dish. 4. Place a medium saucepan of salted water over high heat and bring to a boil. Add the sweet potato, reduce the heat to medium-low, and simmer until tender when pierced with a knife, 10 to 12 minutes. Drain. 5. In a large skillet over medium-high heat, warm the oil. Add the onion, bell pepper, and, if using, serrano pepper, and cook, stirring frequently, until soft, 5 to 8 minutes. Add the garlic and cook, stirring frequently, for 3 minutes. 6. Add the salsa and bring to a simmer. Stir in the spinach and beans and cook, stirring frequently, until the spinach wilts, 2 to 4 minutes. Remove from the heat and stir in the sweet potato. Season to taste with salt and pepper. 7. Spread 1 cup enchilada sauce evenly in the prepared baking dish. 8. Spoon 1/2 cup sweet potato mixture along the center of a tortilla, leaving about 1 inch from the top and bottom edges. Fold the 1-inch top and bottom of the tortilla slightly over the filling. Then fold the right side of the tortilla over the filling. Rotate the tortilla 1/4 turn clockwise. Using 2 hands, gently but firmly squeeze the covered portion of the enchilada towards you and then roll the entire enchilada away from you to form a tight cylinder. Place it, seam side down, in the baking dish. Fill and roll the remaining tortillas in the same manner, placing them seam side down in the baking dish. 9. Spread as much of the remaining enchilada sauce as you’d like evenly over the enchiladas, and if you like things a little saucy, use all of it! Bake until the enchiladas are warmed through, about 20 minutes. 10. 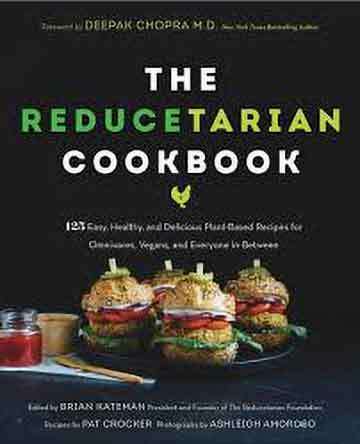 Serve with the avocado dip, vegan yogurt, cashews, cilantro or parsley, and lime juice, if desired. *We’ve got no issues with traditional guacamole. But perhaps you switch things up and try this creamy vegan avocado dip. Simply mash together 2 tablespoons fresh lemon juice, 2 ripe avocados, 3 tablespoons vegan mayo, 1 or 2 finely chopped garlic cloves, and sea salt and hot sauce to taste. Garnish with cilantro. 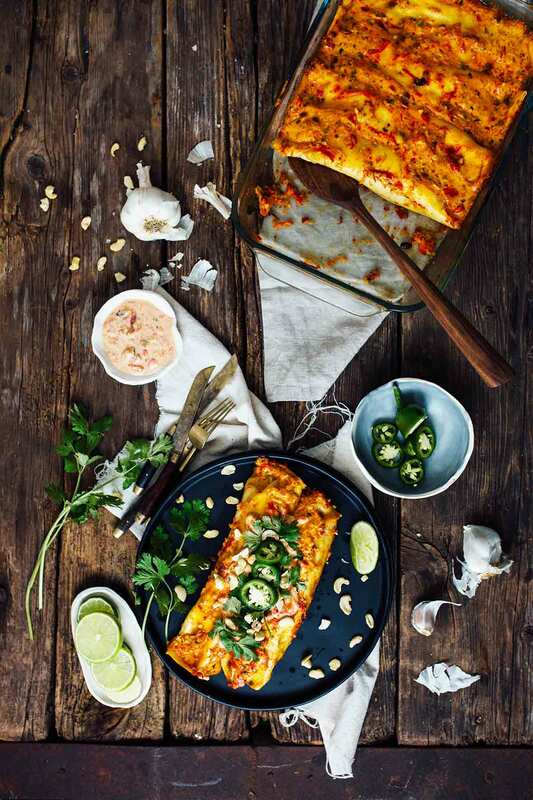 Sweet Potato Enchiladas Recipe © 2018 Brian Kateman | Pat Crocker. Photo © 2018 Ashleigh Amoroso. All rights reserved. All recipes and photos used with permission of the publisher. I am not vegan but these days it’s nice to take a break and eat the rainbow. And this recipe is a delicious way to do so! My kids and I ate these up and they will be a good "Meatless Monday" standby. If you skip the homemade optional steps and replace them with store-bought enchilada sauce and store-bought salsa, this is a quick weeknight meal as well, which is a must in our busy household! I used 6-inch corn tortillas because where we live, in Arizona, it is sinful to make enchiladas in flour tortillas! I think the leftover filling will be great as burritos inside of flour tortillas or in a brown rice bowl. Next time I will top these with a nice white melting cheese such as Jack or Mozzarella since we aren’t vegan. Feta or Cotija would be great as well. I made the Avocado Dip and took less than 5 minutes. I am not used to the tang of mayo in a guacamole-type dip and would prefer to use sour cream instead of vegannaise next time but for vegans it is a super delicious alternative! It was great as a topping on the enchiladas and my son and I also loved it on chips! I really wasn’t sure about the mayonnaise, among the other unconventional ingredients in this recipe. But after one bite, we quickly warmed up to the creamy enchiladas. Since we’ve been trying to be more mindful about our diet—in fact one of us has been eating little to no meat lately—we loved that each enchilada was packed with nutritious ingredients. I had planned to serve the enchiladas on a weeknight, so I made the tomato salsa and enchilada sauce a few days in advance, and the filling the day before, making it possible to serve dinner in less than 30 minutes. They’re actually more like baked burritos, as the tortillas aren’t coated with enchilada sauce before rolling. The enchiladas are generous in size. As a cheese-loving non-vegan, I was certain that I would miss cheese in these vegan Sweet Potato Enchiladas. I even had some queso fresco standing by, just in case. However, my favorite way to eat these enchiladas was just as they are. A little store-bought guacamole was obviously delicious here too, but the enchiladas were pleasantly spicy, tasty, and very filling all on their own. Part of this was due to the addition of really good salsa (I used some that my dad makes and cans yearly) and high-quality enchilada sauce (I did not make my own but invested in the pricier kind at the store, which was rewarded in its resulting flavor). Since I used store-bought sauce and guacamole, as well as canned beans, these enchiladas were easy to throw together and satisfying as a healthier version of a food that I already love. I used flour tortillas but would probably try corn in the future as I typically prefer the texture of corn tortillas in enchiladas. This was a surprisingly good vegan dish! The flavor of the enchiladas was spectacular. There was a nice hint of sweetness from the potato and raisins and peppers. The level of heat was high and oh so good—the salsa I used was nice and spicy plus I used both serrano and jalapeno. First off, I doubled the recipe in order to make sure that I would have enough dinner for a couple of nights, so I went all in! I invested a good amount of money on some of the ingredients, including 2 jars of a nice store-bought local salsa and avocado oil ($12). I typically enjoy sweet potato in anything, so that was a big draw for the recipe. I had some doubts based on the ingredients for the homemade enchilada sauce. I’ve never used vegan mayonnaise for anything, and combining it with the salsa and a few other ingredients produced a pink creamy sauce that looked like something on the Nickelodeon show Double Dare. So I was a bit nervous at one point. I’m so glad I ended up trying the sauce recipe—the mayo gave the enchiladas a nice amount of moisture and fat—I didn’t miss cheese at all. The filling smelled and look great given the Swiss chard I picked up at the farmers market, the different peppers, and the sweet potatoes. A double recipe of sauce and filling made 14 to 16 enchiladas. When the enchiladas came out of the oven, I was so pleased to see that the sauce had deepened to a rusty orange color and no longer looked like lumpy salad dressing.